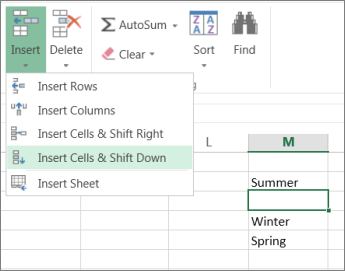 Insert and delete rows, columns, and cells to organize your worksheet better. Note: Microsoft Excel has the following column and row limits: 16,384 columns wide by 1,048,576 rows tall. To insert a column, select the column, select Home > Insert > Insert Sheet Columns. To delete a column, select the column, select Home > Insert > Delete Sheet Columns. Or, right-click the top of the column, and then select Insert or Delete. To insert a row, select the row, select Home > Insert > Insert Sheet Rows. To delete a row, select the row, select Home > Insert > Delete Sheet Rows. Or, right-click the selected row, and then select Insert or Delete. Select one or more cells. Right-click and select Insert. 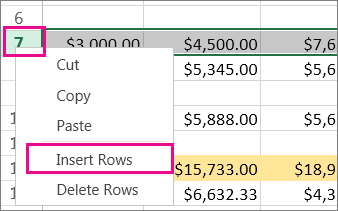 From the Insert box, select a row, column or cell to insert. On the Home tab, click the arrow under Insert, and then click Insert Cells & Shift Down. To insert a single row : Right-click the whole row above which you want to insert the new row, and then click Insert Rows. 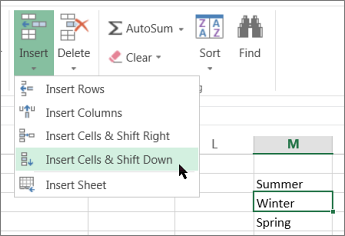 To insert multiple rows: Select the same number of rows above which you want to add the new ones. Right-click the selection and click Insert Rows. 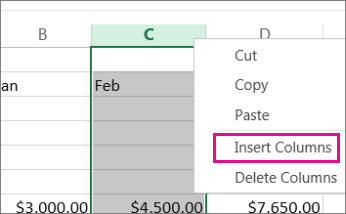 To insert a single new column: Right-click the whole column to the right of where you want to add the new column. For example, to insert a column between columns B and C, right-click column C, and click Insert Columns. To insert multiple columns: Select the same number of columns to the right of which you want to add new ones. Right-click the selection and click Insert Columns. 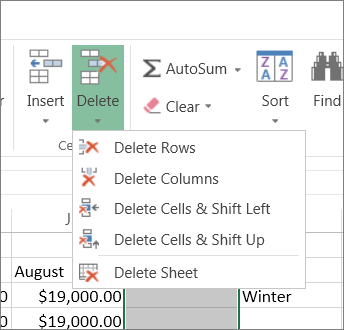 Select the cells, rows, or columns that you want to delete. On the Home tab, click the arrow under Delete, and then click the appropriate delete option. When you delete rows or columns, other rows or columns automatically shift up or to the left. Tip: If you change your mind right after you deleted a cell, row or column, no problem, just press Ctrl+Z to restore it.